This two-hour walking tour, led by a highly trained historian tour guide, is an essential immersion into our city’s culture. But that’s not all. It also includes a tour of St. Louis Cemetery #1, our oldest above ground cemetery, dating back to 1789. 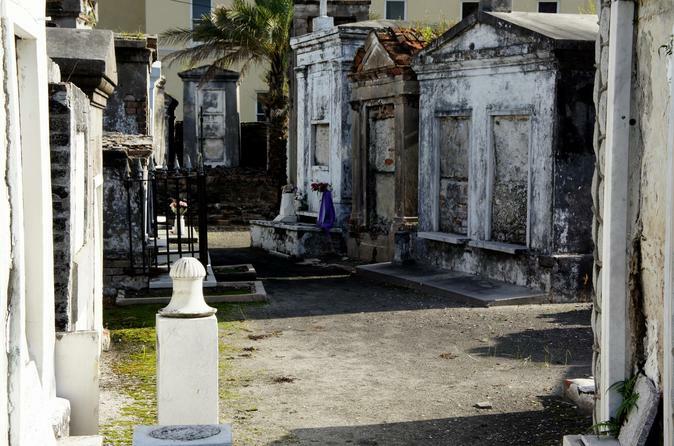 Learn about creepy crypts, some crumbling but others still displaying polished stone etched with the names of some of our most famous citizens including French Creole nobleman Bernard de Marigny and the 19th Civil Rights activist Homer Plessy. Of course, no Voodoo tour is complete without a visit to our most famous Voodoo Queen, Marie Laveau. Learn about her amazing life as you pay homage at her final resting place. This tour starts daily at 2pm. Please meet outside of 601 Chartres St 10-15 minutes prior to tour time. Major stops and content include: History of Voodoo, Jackson Square, Armstrong Park, Congo Square, St. Louis Cemetery #1, Marie Laveau’s tomb, Voodoo Cultural site or establishment. This tour branches beyond our colonial history, delving into the continued development of New Orleans culture into the 19th and 20th century. Learn about the development of Voodoo and its practitioners’ blending of African tribal spirituality, Catholicism, and magical beliefs as you stroll the city’s oldest neighborhood, the French Quarter. Discover the origins of Jazz music and then uncover the brutal realities of America’s largest slave rebellion as you trace our culture through Louis Armstrong Park and Congo Square. Discover our Afro-Caribbean influences that closer resemble Cuba and Haiti than the American South.